Empowering Ethiopian Women Group arranged a gathering on June 10, 2018, @ 3 – 5 pm. The mission of this meetup is to help women in our community to advance in the workplace and become leaders. 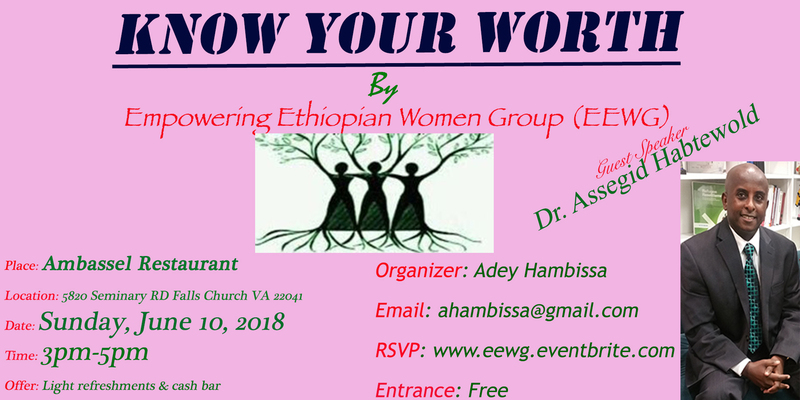 This meetup is for all Habesha women who are starting a career or need more support building their confidence to become leaders in this competitive market and not be limited to reach our highest potential because our Cultural barriers are getting in the way. In this meetup, we will discuss how to bridge the leadership gaps in our community. We will cover how to know our value and feel equal with anyone we interact with and to improve our lack of confidence. Dr. Assegid Habtewold is the guest speaker. He is a speaker, host of Pick Yourself Up TV show, wrote 4 books on leadership, founder of PRO Leadership Global- a Non-Profit Organization that focuses on immigrants, women, and youth. Women’s rights advocacy groups should continue to engage in increasing the awareness of both women and men concerning the existing gender inequality and things to be done to bridge the gap. However, the existing advocacy works aren’t adequate. The advocacy works shouldn’t be left to women and to those organizations that represent women alone. Both women and men who understand the inequality that exists, and the dire consequences of this disparity should continue to push regional and global institutions, governments, companies, and community and religious organizations to make changes- Tangible changes in their perceptions, policies, and systems. While continuing to promote gender equality, the long-term and lasting solution is to raise competent women leaders at all levels. In my humble opinion, it’s possible women advocacy organizations to kill two birds using one stone if the lion share of such organizations’ priority, focus, and investment is directed toward building the leadership capacity of women. The more women become leaders at home, in the neighborhood, work, and marketplaces, the more they will have real chances to influence and ultimately bridge both the gender inequality, and the leadership gap that exists at all levels. Myself as women’s rights advocate, leadership expert, and our non-profit organization- PRO Leadership Global Inc., we are committed to playing our share. We look forward to partner with all concerned stakeholders to bridge the gender leadership gap, and in turn empower women to play their contributions in tackling local, national, regional, and global challenges we are facing. It’s possible. We can use 1 stone (developing women’s leadership capacity) to kill 2 birds- gender inequality and leadership gap. PRO Leadership Global Inc. (www.proleadership.org) is a non-profit organization based in Maryland, US. PRO Leadership PROmotes the right kind of Leadership, PROduces great leaders to bridge the leadership gaps (including gender leadership gap) worldwide one community at a time. If you would like to support what we do, feel free to reach out to us, and be part of the movement. Time is up for those who undermine the dignity of any human being regardless of their gender, ethnicity, and race. A new day is on the horizon. Winfrey said, “For too long, women have not been heard or believed if they dare speak the truth to the power of those men. But their time is up. Their time is up.” ‘Time’s up’ is a movement. Movements don’t just happen. Multiple factors lead to a particular movement. This is one of the proudest moments in the history of humanity where courageous women and men stood against abuses. We’re in the 21st C, and we should never tolerate abuses against any human being because of their gender, race, ethnicity, and so on. A human being is an image of God. God is Spirit, and a human being is a spirit housed in a bio suit. Many use the outside body to think that they’re better than others and belittle others who don’t have the same physical attributes they have. That is superficial. The inner man/woman doesn’t have gender or color or cultural affiliation. A just God equally created us all in His own image. The least we can do to others is to give them the same respect we have for ourselves. Discriminating, and abusing another human being shouldn’t be tolerated in the 21st C. Time’s up! Oprah Winfrey’s speech inspired us because, at PRO Leadership, we firmly believe that leadership is the birthright of all. Each individual has a unique place to take the lead according to her or his purpose in life. However, though there is a leadership gap in every society in the world, we have focused on raising leaders in developing countries. The simple reason is that leadership is more needed in developing countries that are more affected by the major ills of the world. We also believe that though women shoulder more responsibilities in their communities, organizations, and nations, they aren’t at the front where they have the passion and ability to lead. That is why we advocate for women’s leadership. We cannot address the challenges we face in our communities, organizations, and societies without removing barriers such as discrimination, abuses, and biases against women, and without empowering them to the fullest. We also believe that the future is for the youth. The destiny of every community, organization, and nation is in the hands of its youth. Unfortunately, many institutions and societies don’t invest in their youth proactively. There is a huge generational gap, which needs serious attention. Accordingly, PRO Leadership aims at bridging the three (Geographic, gender, and generational) leadership gaps. Join this movement and let’s bridge these gaps and tackle the major ills your community, organization, and society are facing. Following the publication of my book entitled ‘The Highest Level of Greatness’ (check out the release video if you’ve not yet), I had an informal interview to answer some tough questions such as ‘Do you really think everyone is a greatness material? You wrote a book on greatness, have you attained greatness yourself? Your country is one of the poorest. You talk about greatness while millions are starved and in need of food? And so on. If you’re interested in watching the interview, click here and check it out. In this blog, I’d like to answer some key questions regarding the contributions of the book toward the mission of PRO Leadership. Is there a direct relationship between greatness and leadership? Yes! There is a direct relationship between greatness and leadership. When you study your great ones, you could easily figure out that they were great leaders. It’s impossible to attain greatness without the ability to lead. How does this book contribute toward the mission of PRO Leadership? PRO Leadership Global Inc. is a non-profit organization whose headquarter is in Maryland, USA. The mission of PRO Leadership is to bridge the leadership gaps to tackle the major ills of the world one community at a time. We need as many great leaders as possible to tackle the acute and chronic challenges this generation is facing. We cannot fix poverty, famine, conflicts, poor governance, environmental degradation, displacements, and other challenges we are facing without raising leaders among the people who are affected by these ills primarily. We need extraordinary leaders who believe in themselves; individuals who believe that they have greatness within; individuals who are willing to serve well beyond their immediate needs, and family. Our goal is to raise competent leaders who step into their greatness and serve the world around them and beyond based on their purpose, passion, and strengths. Our motto is PROmoting Leadership, PROducing Leaders. As you can see, it has two parts. We promote the right kind of leadership. In my first book ‘Redefining Leadership: Navigating the path from birthright to fulfillment in life,’ which was published in 2011, I simply defined leadership as ‘Knowing oneself, the reason for existence, and pursuing it until fulfilled’. This definition permits each and every individual to venture out and take leadership. You don’t need to have leadership in your bloodline. You don’t necessarily need to graduate from college. Leadership isn’t, first, about others. It’s not also about the position you occupy and the title you hold. It’s first to know oneself very well, and one’s purpose. We cannot lead others successfully before we know ourselves and lead ourselves first successfully. The great ones were clear about who they truly were and why they were there in that particular space, time, and generation. They went out to pursue their purpose. They didn’t begin by saying, ‘Let me go out and inspire, influence, and guide others.’ They first led themselves successfully. Those people who shared their purpose saw the self-assurance, confidence, and their ability to lead self. Then, they believed, trusted, and followed them. The second part of our motto is Producing great leaders. There are lots of insight and approaches you could get from this book so that you too become a great leader like your great ones. You’re unique. You have what it takes. The great ones before you were where you’re today. Learn from their journey. You don’t need to reinvent the wheel. You can learn so many great lessons from these great ones who changed the world for good because of their extraordinary leadership ability. You too can follow their example, and become one of the great world changes in your lifetime, and in turn, contribute your share in tackling the major ills that are tormenting your community in particular, and the human race at large. Who are some of the great leaders you mentioned in the book? The book narrated the stories of many great ones from diverse religions and cultures. I’m sure that you could be able to relate with all or, at least, some of the great ones who attained the highest level of greatness. Let me give you some examples. Think about Mahatma Gandhi who is from India. Mother Teresa and Joan of Arc from Europe. Nelson Mandela from Africa. Thomas Edison, George Washington Carver, and Martin Luther King Jr. from the US. And many more. Some young, others were old. Some blacks, others whites. Some from the West while others from the South and East. They were also of both genders. Their industries were also diverse. Some of the great ones were from politics, others from science, religion, still others from humanitarian fields. What are the key takeaways for leaders? There are lots of takeaways. I encourage you to read the book. This book took me over two decades of research, reflections, and implementations of the truths I had uncovered about the human potential. However, for now, let me give you a couple of takeaways. First, like greatness, everyone can become a leader. And, leadership is the birthright of all. However, having the potential and what it takes to become a great leader is not enough. We have to pay our dues. Every good thing has a price tag. Second, the book doesn’t promote any kind of greatness. Likewise, we at PRO Leadership don’t promote any kind of leadership. 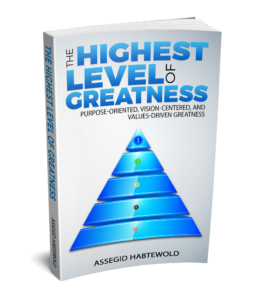 The book emphasizes that one’s greatness (leadership) should be based on a worthwhile purpose. In history, great leaders were those who had a cause and those who went all in to pursue it. They were persuaded that they were the right persons to pursue and fulfill those causes for which they were willing to die for. One cannot go far, have impacts, and leave a legacy, unless that person’s leadership is based on his/her uniqueness, their reason for existence. Third, the key roles vision plays in one’s success in life. We may know who we are, and the reason for our existence. However, we need to see the accomplishment of our purpose in a picture clearly. That is why the great leaders that we all admire were visionaries. Actually, the world has been influenced and shaped by visionaries. They saw the end from the beginning. The vision kept motivating them till the end. They overcame challenges and continued to lead against all odds because the end they saw was too good to let it go that they were willing to keep getting up even if they were knocked multiple times. Fourth, the significance of becoming a values-driven leader. It doesn’t matter that we have a grand cause and a glorious vision. We need values that define who we (individually and as a team) are. We need to discover those values that can advance the purpose, and protect the vision. Review history, the leaders who succeeded and left a legacy were principled. On the other hand, think about the leaders who stumbled. They didn’t have values, or they had, but they compromised their values or violated some universal values. I’m sure this book empowers you to become an extraordinary leader. You can also use it to empower your team. To refresh your memory, the mission of PRO Leadership is bridging the leadership gaps worldwide one community at a time. These gaps were created because of some barriers. Nonetheless, the main reason is that the overwhelming majority doesn’t believe that they are greatness material and becoming leaders in the area of their passion and according to their unique purpose is their birthright. Many shy away from taking leadership responsibilities by citing so many lame excuses. Though it is understandable why many avoid stepping up and be part of the solution to the major ills the world is facing, we cannot just exempt ourselves and expect others to take leadership initiatives and address these challenges we face. The major ills the world faces demand great leaders like yourself. You have what it takes within you to unleash your greatness by becoming a leader in your life and your mission in life. In my latest book entitled ‘The Highest Level of Greatness: Purpose-oriented, vision-centered, and values-driven greatness’, I shared the stories of great leaders from diverse cultures who were like you and me when they began their leadership journey. Using a framework, I clearly showed how ordinary individuals could achieve extraordinary results and attain greatness as far as they discover their unique purpose, envision the completion of the purpose, and demonstrate an unwavering commitment toward their core values. You’re not exceptional. The challenges your community, nation, and the world face demands that you step up. Like those who went before you, the great ones, you should bring out your best, impact the world around you and beyond, put a dent in the history of humanity, and leave a legacy that outlives you and your generation. More Greatness books and specific books on Leadership are coming in 2018. We’re also preparing to launch a Show that brings to you high impact interviews in our effort to bridge the leadership gaps. Stay Tuned! Why a few attain envious greatness and changed the world? True leaders are world changers. They are pacesetters, trailblazers, and more. Great leaders are candidates to attain envious greatness in their lifetime, generation, and beyond. In this regard, I’m writing a book. It will soon be published. Stay tuned. […Have you ever asked yourself “Why a few achieved greatness and changed the world while billions have come and gone without even leaving the slightest clue that they have ever been here on this planet?” I’ve studied the great ones for more than two decades. It was easy to discover that out of billions of people, we only have had a few great ones in every generation. This is regardless of everybody, whether they would like to admit or not, wanting to be great. Unfortunately, only a few attained true greatness because the few great ones did what the mass avoids doing. Declared their freedom, at least, within. Dared to leave their comfort zone. Dived into the unknown to live up to their full potential. Defied fear and stepped into their greatness boldly. Believe that you’re a greatness material. Be persuaded that, within you, there is greatness and unlimited potential. If you just believe that, you’re stepping into your greatness away. If you haven’t yet, vow to leave the world around you better than you found it. PRO Leadership Global Inc. (www.proleadership.org) is a 501 (c)(3) non-profit organization based in Maryland, US. PRO Leadership PROmotes leadership, PROduces leaders to bridge the leadership gaps (Geographic, Gender, and Generational gaps) to tackle the major ills worldwide one community at a time. If you would like to support what we do, feel free to reach out to us, and be part of the movement. PRO Leadership’s media arm- Bridge, will soon begin producing interviews that aim at bridging the leadership gaps one community at a time. Sign up to get our quarterly online magazine and updates. We respect your privacy, won't sell or rent your email account. Support the efforts of PRO Leadership by donating through the secured Pay-Pal system. PRO Leadership is a registered 501(c)(3) tax exempt non-profit organization (Tax ID: 27-1158064). Your gifts are tax deductible as a charitable contribution within IRS guidelines.